There will be spoilers. And it is better to read this book without spoilers. So I will try to have all non spoilers at the top and spoilers afterwards, clearly marked. And I cannot do much more to make you read this book without spoilers short of showing up at your house and forcing you. The Plot: Gabriel is dying. He lies in bed, aged only twenty, his life slipping by and looks back on his life; his strict parents, his isolated town, his brother, his beloved dog, and his friendship with the Finnigan, a Huck Finn type child who is wild and unruly, the opposite of Gabriel. But nothing is what it seems; even Gabriel's name isn't Gabriel. 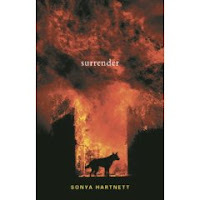 Surrender is his dog; but it's much more than that, as Gabriel surrenders to his fate. The Good: The language is stunning. "The sun's like a coin that's been buried for years." It's the type of writing that you almost forget what you're reading, as you enjoy the words and the language. I began this book, disliked it, read the last chapter, had a very "meh" response. Because it's an adbooks contender, I picked it up to read the whole thing. Turned out, there was a lot I missed; and while I'm not sure I can say I liked this book, I am fascinated by it, and impressed by the language, which is why I'm adding it to my Best Books of 2006 list (see sidebar). In order to say why I am fascinated, I have to go into full on spoiler mode. The Plot: Gabriel's real name is Anwell; and he relates a story of growing up in a small, isolated town in Australia; of meeting a wild boy, Finnigan, who is Anwell's opposite in everything, Bad to Anwell's Good; of strict parents; of a disabled brother; of Anwell, at the age of 7, causing the death of that brother; of his Mother knowing what had happened with enough time to rescue the brother, but not doing so; of his beloved dog, Surrender; of his father making Anwell shoot his dog; and finally, Anwell taking a hatchet to his parents. But. Gabriel is in a white room (a hospital? a prison? home? ), ill and dying; he fears and wishes for Finnigan to visit; and by the end, it is clear that there is no Finnigan and never was, but that Finnigan is very real to Gabriel and Finnigan is killing Gabriel. At this point, almost anything could be argued as not being real and being imaginations and hallucinations of Anwell/Gabriel. The Good: The part about Finnigan not being real left me very "meh". Seen it, in various stories by Stephen King and in The Other (the book and movie by Thomas Tryon.) And the idea of Finnigan being Anwell/Gabriel's other half, or the ghost of his brother; well, there is plenty to discuss for book discussions. But I began rereading, this book with beautiful language, that I thought was an inside look at mental illness and suddenly BAM the older brother is locked in a fridge while Mom watches with a hint of a smile and then BAM Gabriel takes the axe -- it was like I was suddenly reading a book version of The Descent but with pretty language. (Yeah, a scary gross horror film; but one that is just as much about the descent into madness as Surrender is not just the name of a dog.) It's not just the metaphor, a frequent horror film device; the language.... it's the equivalent of watching the shooting scene during Face/Off when the Wizard of Oz song is playing in the background. Sort of like Stephen King in a PBS dress. The killings take Surrender from a psychological drama with plenty of book discussion type questions (who is Anwell? Who is Finnegan? Who is starting the fires? What does Anwell/ Gabriel know about what is going on? Is Gabriel even really dying? Did any of it really happen?) to out right horror, as the mother looks at the refrigerator knowing her son is in there, then turns to back to her nap, or later, as the blood and the brains of the parents spatter the room. Is any of it real? Is it all the imaginings of a tortured mind? Does Gabriel only think he killed his parents, because that was the only way to be free of them? Or is he a tortured child, driven to the unthinkable? Who is the right audience is for this book; why teens? Why not adults? Would this get a bigger audience if it was sold adult? Anyway... it's one of those odd books that I cannot say "I loved it" because it is so disturbing. But I can say it haunts me. And I can say it is one of the best books I've read this past year. Links: the Gail Giles review. The Seven Impossible Things Before Breakfast Review.